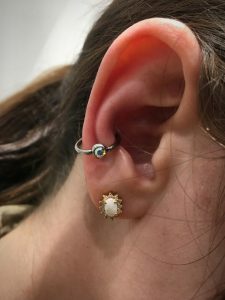 Conch piercings have become one of the most popular trends in body piercing, partly because of the versatility they offer, and partly because they just look great! If you didn’t already know about conch piercings, and your first thought was about the huge shell on a beach, that’s okay. This post will help you to learn more if it’s a piercing you’re thinking about or considering something new and different. 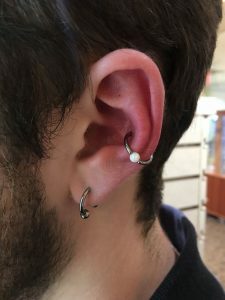 A conch piercing is situated in the biggest section of your ear cartilage, in one of two open areas separated by another ridge of cartilage that projects out between them. The lower of these two areas is the inner conch, and the upper section is the outer conch. Together they provide considerable surface area for a variety of body jewelry, so you can really get creative if you want to. As with many cartilage piercings, though, a little more healing time is generally necessary. Try a salt soak: This is generally the most effective treatment for any cartilage piercing, and it’s totally safe. Add lavender essential oil: The addition of a very small amount of lavender to your salt soak will make it even more effective, because the lavender has excellent soothing properties. Clean with glycerin soap: The soap is great for cleaning the outer portion of the piercing. For anything in the ear, it’s great for removing residues from shampoo, conditioner, and any other hair products you may use. Conch piercings are likely favored because there are so many great jewelry options. You can get them pierced with hoops, horseshoes, small barbells or labret studs. You can add opals, gems, or get colored titanium jewelry. You can completely customize your jewelry to suit your style when you get pierced. Multiple conch piercings are also becoming popular, with anywhere between two and four piercings potentially possible on the broad surface area of the conch. 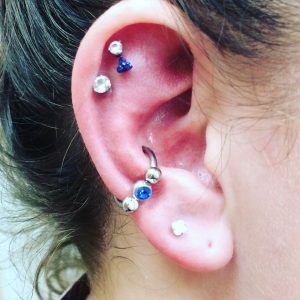 Visit the Almost Famous Body Piercing location closest to you, and get started on your own new conch piercing.